At the Penumatic Institution in Bristol, founded in the closing years of the eighteenth century, dramatic experiments with gases precipitated a revolution not only in scientific medicine but also in the modern mind. Propelled by the energy of maverick doctor Thomas Beddoes, the Institution was both laboratory and hospital - the first example of a medical research institution. But when its researchers discovered the mind-altering properties of nitrous oxide, or laughing gas, their experiments devolved into a pioneering exploration of consciousness, with far-reaching and unforseen effects. "Enthralling. This is exactly the kind of cross-cultural biography we need. 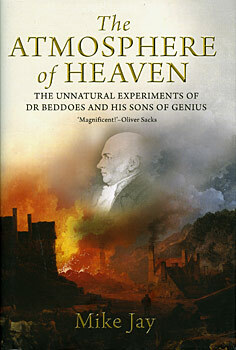 Lively and sympathetic, it restores the renegade Dr. Thomas Beddoes to his rightful place in scientific history, but also to his revolutionary circle of literary friends." "The pursuit of science in the evolution of culture does not get much more hair-raising than this. Mike Jay's The Atmosphere of Heaven is history written as it should be." "This wonderfully sympathetic account is written vividly and with narrative flair. Bringing together medicine, chemistry, and politics, The Atmosphere of Heaven is a compelling read."